Calling this game Tekken Mobile instead of Tekken Tap Tournament is a missed opportunity, but that’s besides the point. Tapping on a touchscreen and using cards for special moves is weird. Officially launched in North America last week for iOS and Android, Tekken Mobile is a very mobile fighting game. 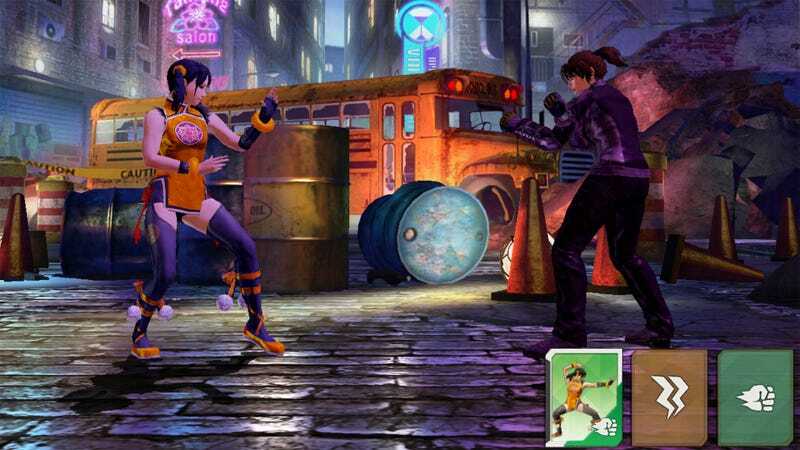 The technical complexity of the console and arcade entries in the storied series is gone, swapped for the same sort of tap-to-attack gameplay seen in other popular mobile fighters. It feels like a Kabam game, like Marvel’s Contest of Champions or Transformers: Forged to Fight. Players tap on the right side of their screen to attack, the left side to block, and hold the left side to deliver a powerful block-breaking attack to their opponent. Adding a little bit of complexity and flashiness to battles are Waza cards. Each character unlocked through treasure boxes, in-app purchases or collecting shards has a customizable deck of nine Waza cards. Each card features some sort of special attack or ability. As a fight progresses, these cards activate, allowing players to add a little extra oomph to their attacks. It’s a feature comparable to the slowly recharging powers given to fighters in Power Rangers: Legacy Wars, only without the strategic element of each card costing a certain amount of energy to activate. Tekken Mobile isn’t a bad little game. There’s a story mode to work through, clan battles against other players’ teams of fighters, and regular daily and special events to participate in. All characters enjoy a sort of RPG-style level progression, complete with a talent point system to beef up their abilities as they grow. Plus it looks pretty great for a mobile title. It’s just weird seeing Tekken like this. I’m used to a game where any character can be selected without having to worry about unlocking them, paying for them, or collecting enough shards to activate them. I am certainly not used to seeing special character-themed in-game purchase bundles with costs ranging from five dollars to around $50. Imagine spending nearly $50 worth of in-game currency on a special three-star ranking version of Feng. Only ten per customer, let’s not be greedy now. It’s weird. Maybe it’s just because I’ve been playing the console version so long. Maybe there are mobile-only gamers out there who will play this and go, “Huh, I wonder what the normal version of this is all about?” Wouldn’t that be nice.